The Sjögren's Syndrome Foundation is thrilled to welcome Shannon Boxx as the 2013 Honorary Walkabout Chairperson! Shannon Boxx, member of the U.S. National Women’s Soccer Team and Olympic gold medalist, has been an inspiring Sjögren’s advocate since she announced she has Sjögren’s this past year and was connected to the Foundation by Athletes for Hope. Shannon is now taking Sjögren’s awareness to communities around the United States by stepping up as the SSF Honorary Walkabout Chairperson! If there is already a Walkabout in your area and you would like to learn more about it or if you are motivated and want to start an event in your area- please contact Ben Basloe at 301-530-4420 x207 or by email at bbasloe@sjogrens.org to learn how you can get involved! Want to learn more about Shannon's journey with Sjögren's? Listen to her interview with American Airlines and US Airways about being diagnosed with Sjögren's and why raising awareness is so important to her by clicking here. We hope you will join Shannon and step up for Sjögren's in your community by participating in a SSF Walkabout! 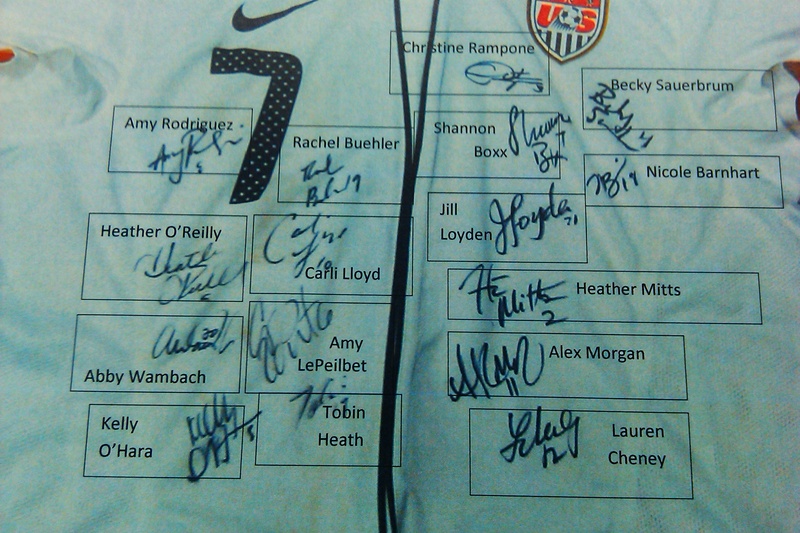 The Sjögren’s Syndrome Foundation is honored to be auctioning off a gift from Shannon Boxx who is currently competing as a part of the USA Women’s Football Team at the London 2012 Olympic Games! 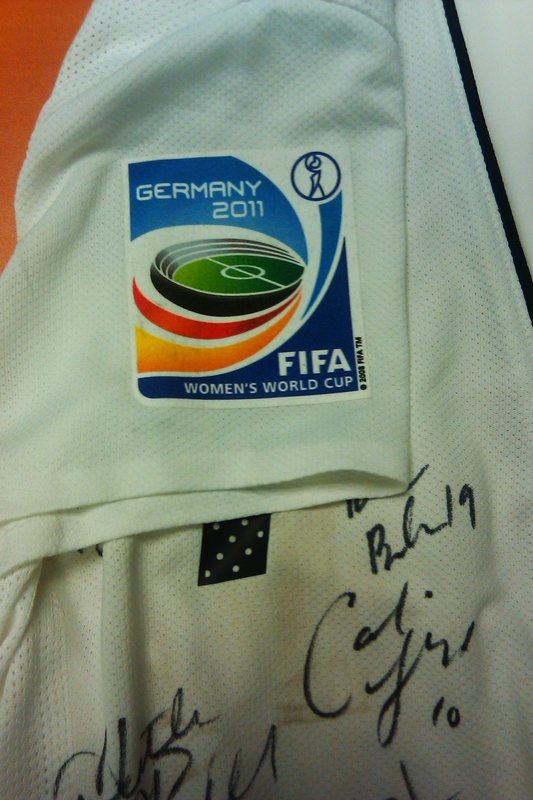 Shannon Boxx, World Cup soccer player and Olympic gold medalist,sent the SSF her FIFA Women’s World Cup Germany 2011 jersey signed by her and her teammates. 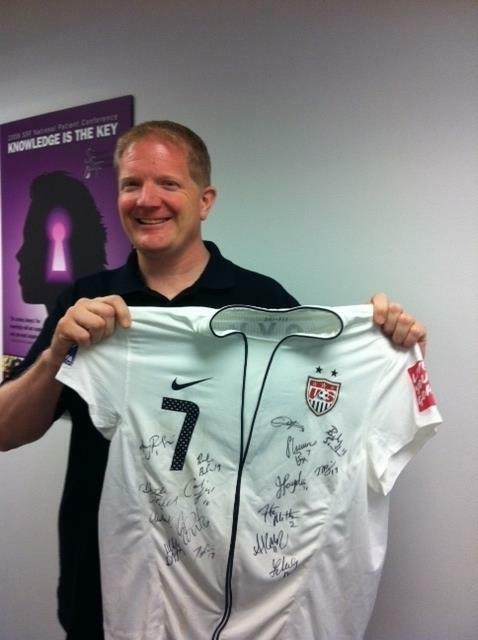 Here is Steven Taylor, SSF CEO, holding up the jersey at the Foundation’s office in Bethesda, MD. 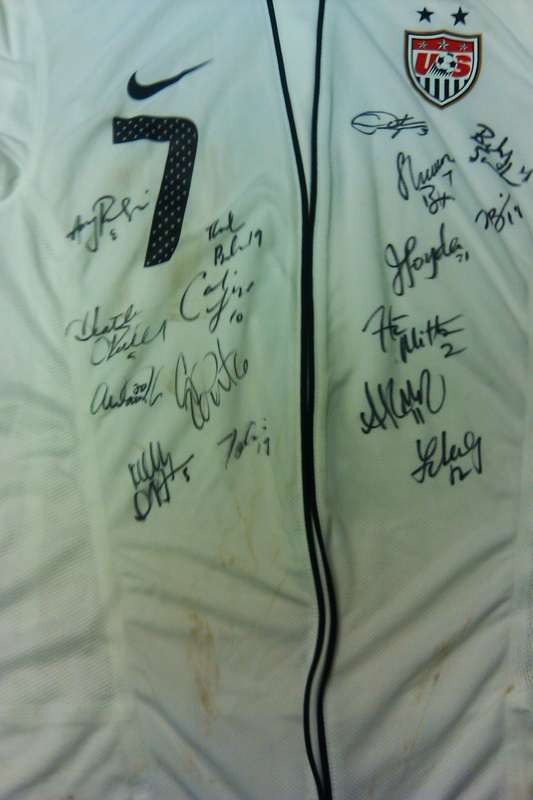 All proceeds from the jersey will go directly to the SSF research program to help us find the answers needed to unlock the mystery of Sjögren’s. Thank you Shannon for your support!